I looked at a course map for the Oyster Bay 5K that I plan to run on Saturday, October 15. The first 1.3 miles are all uphill and, according to Gmaps and MapMyTri, the overall elevation gain is greater than James Street, the bane of Cow Harbor racers. The saving grace, if there is one, is that this hill stretches a lot farther than James Street, and that may mean that the grade is lower. I'm hoping that's true. My run today was a little disappointing. After good experiences on Wednesday and Thursday, where I had great energy and form, I had hoped for another good run. I can't explain it exactly, but I felt unbalanced and under-powered this morning. I even modified my route, shortening its length to save time after a late start. As I was running, I thought about whether I'd be the "Thursday me" or the "Friday me" when I go out on the hilly course a week from now. So, what does it mean when you run well for days and then you don't? In this case, I don't think it means that much. I probably needed more rest and it wouldn't hurt for me to stretch a little. Sometimes it's timing of your performance curve, good days and bad. Right now I'm hoping this 5K coincides with a good running day. 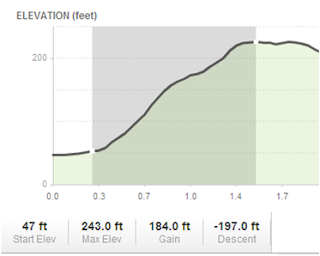 With that hill, I'm going to need all the advantage I can get. Thanks, looks scary. Wish I could do your pace!